After having its world premiere at this year's South by Southwest film festival, A Quiet Place quickly established itself as one of the year's best horror movies. Directed by John Krasinski, the film co-starred Krasinki and Emily Blunt as two parents doing their best to keep their children safe in a world overrun with sound-sensitive creatures. 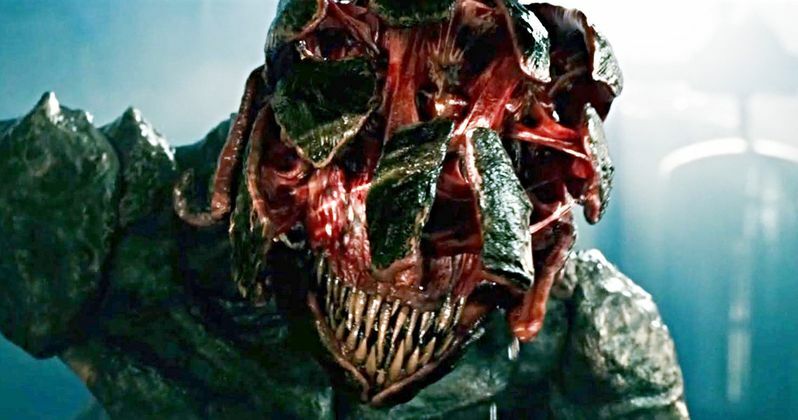 Krasinski's work on the film wasn't limited to directing and playing the Abbott family patriarch, however, as the actor has revealed he was the one to portray the mysterious monster as well. On a recent Jimmy Kimmel Live! appearance, Krasinski spoke about his directing duties while working on the film. It was up to him to explain to the crew how the monster was to move, but actions certainly speak louder than words. As the actor and director shows in a photograph taken from the set, Krasinski wore a motion capture suit to provide the movements of the monster in the film himself. It's something fun to keep in mind on future viewings of the movie, although the image of Krasinski in the suit might make the creature just a tad less scary. In the interview, Krasinski spoke a lot more about A Quiet Place beyond portraying the creature. Also revealed is that he intentionally wrote the role of Evelyn Abbott for Blunt, his real-life wife. Krasinski touches on how much it meant when horror legends Stephen King and Guillermo del Toro offered their approval for the film, and their endorsement only helped the movie's success. For reasons apparent for those who've seen the movie, Krasinski also says he wrote it partially as a cinematic love letter to his children. Indeed, the film turned out to be a blockbuster at the box office, which was just as surprising for Krasinski as it was everyone else. On a budget of $17 million, the movie would draw nearly $335 million in worldwide ticket sales. The film was not only a financial success, but the majority of fans and critics were in love with it as well. Unsurprisingly, a sequel has since been ordered by Paramount, with Krasinski writing the script and Platinum Dunes producing. As of now, nobody is attached to direct, but the film has been given a release date of May 15, 2020. A Quiet Place is certainly a contender to be a big player when it's time to start handing out the awards. It seems likely the film will be up for Best Picture, with Krasinski in the running for Best Director. With him writing the screenplay for the sequel as well, hopefully the follow-up film will reach the same level of quality as the first, though it will certainly be very hard to top it. In any case, it's interesting for fans of the film to see the director continue to provide interesting behind-the-scenes information in the meantime. You can watch the Krasinski interview about A Quiet Place on Jimmy Kimmel Live below!